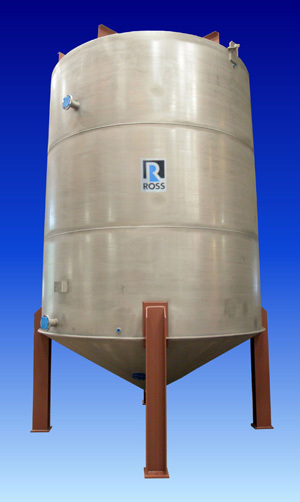 Custom fabricator Ross Engineering builds storage tanks, pressure vessels and reactors equipped for accurate temperature control via heating jacket, internal coils, electrical heat tracing, or heat exchanger. Shown is a 7,000-gallon stainless steel atmospheric tank designed to regulate product temperature up to 100oF using a 3” diameter helical coil rated for 80 psig. The 10' OD x 12’ straight wall vessel has a flat top with mixer bridge, a cone bottom with compression ring and support legs with repads. Also supplied are various size flanges, dip tube and a manway. All circumferential, longitudinal and nozzle welds are liquid penetrant tested in accordance to ASME Section VIII, Div.1. Both the vessel and coil are hydrotested as well. With state-of-the-art machining and design capabilities, Ross Engineering accepts a wide range of fabrication projects, from simple storage vessels to complex reactors and tank farms. Typical materials of construction include carbon steel, 316 and 304 stainless steel, aluminum, Hastelloy, Carpenter Alloy 20 and Inconel. Atmospheric, vacuum and high pressure designs are routinely built in various tank geometries.